Last night, just about everything went the Bruins' way. 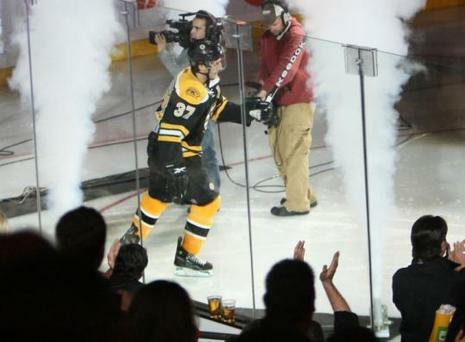 Patrice Bergeron made a successful return before a sellout crowd at TD Banknorth Garden and was among the game's best performers. Tim Thomas looked crisp in his third start of the season. The Bruins generated scoring chances and limited the potent Pittsburgh attack to one-and-done scoring chances. The only thing that went sour was the outcome. Patrice Bergeron had not skated on Garden ice in a game that mattered in a year. It was Oct. 27, 2007, when he was hit from behind by Philadelphia's Randy Jones, suffering a concussion that left him dizzy, disoriented, and buried in a headache. He was sidelined for a week, then a month, then another month, and ultimately, the rest of the season.